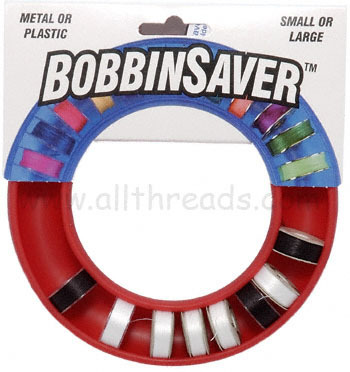 BobbinSaver Bobbin Holder holds metal or plastic bobbins of all different sizes! Shaped like half of a bagel and hollowed out, it is made of flexible rubbery plastic that expands to receive the bobbin and promptly snugs up around it. Threads won’t tangle or unwind. BobbinSaver holds over 20 bobbins securely and is a simple elegant gadget to store any kind of bobbin. Works great with all our prewound bobbins. Measures 3/4" tall and 5 1/8" diameter. Available in Red, Blue and Lavender.